In the UK, young people are being targeted by the government in a bid to recruit thousands more care workers. 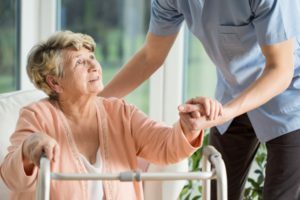 Despite more than 1.45m people currently working in social care, there are 110,000 vacancies in the workforce – a figure which is expected to rise by an additional 650,000 by 2035 due to an ageing population, ministers have reported. To tackle this, the government has launched a campaign entitled Every Day is Different which will promote a range of roles, including carer in a nursing home, activities coordinator in the community, hospital occupational therapist and personal assistant in a person’s home. Have you seen or heard the adverts? The campaign is being promoted on social media and online platforms, while the aim is to attract a diverse range of people, it will be targeted at people aged 20 to 39. This, the government says, is because research suggests this group is the most likely to consider a role in adult social care. “Adult social care is too often seen as the ‘Cinderella service’ to our NHS,” said Minister of State for Care, Caroline Dinenage. “There is a huge demand for more care professionals who work incredibly hard to look after the most vulnerable people in our society. We must spread the word that careers in adult social care can be rewarding, varied and worthwhile. Care is a vocation where you can transform people’s lives and every day is different to the next.as a report claims a lack of community staff may damage the NHS. The report, published by the Health Foundation, expresses concerns about the growing number of staff shortages across the board, adding that there are “worrying trends” in community care, with a drop in nurses and health visitors. While the new campaign has been welcomed by charities they insist that more needs to be done to improve work conditions and pay for employees. George McNamara, director of policy and influencing at Independent Age, told ITV News: “Workers are leaving due to low wages, little job progression, lack of training and perceived lower status compared to similar healthcare roles. In February 2018, the standard hourly rate a care worker in the independent sector would receive was £7.82 per hour. I am keen to see more youngsters have a career in social care. It is rewarding, enlightening and to have a job where you make a real difference to people is a pleasure. I work with some fantastic youngsters who have chosen to work in care. They love what they do and enjoy the environment. I will be working with schools and colleges moving forwards to encourage others to do the same.